Fill, pour and clean with ease with the 16 Quart Dual Spout Pail. It is designed with a large rectangular opening to accommodate a standard sponge mop, along with two narrow spouts for smooth, controlled pouring, helping to reduce messes and spills from either end. The color-accented handle provides a comfortable grip surface for easy transporting of contents inside between chores. 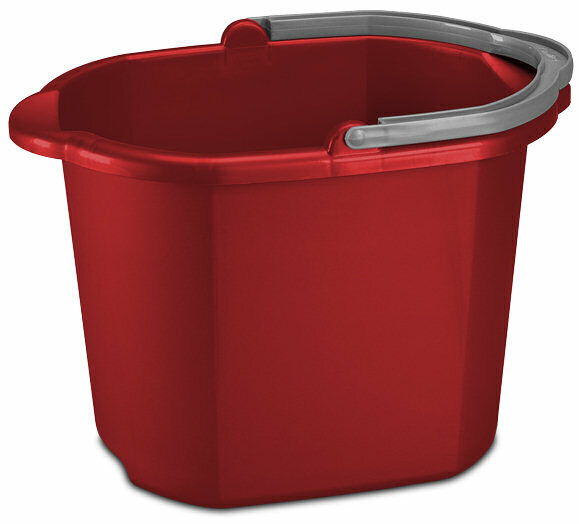 The pail offers durable construction with a reinforced rim and an easy-to-clean surface perfect for long term use. 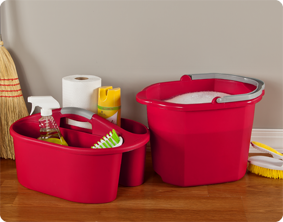 This Dual Spout Pail is great for tackling all sorts of household cleaning chores such as moping floors, washing woodwork, cleaning vehicles and more. The overall product dimensions of this item are 15 3/4" L x 11 1/2" W x 11 1/4" H.
Overall Assembled Size: 15 3/4" x 11 1/2" x 11 1/4"
Ideal for general household cleaning projects or for use in mopping. 16 Quart Dual Spout Pail is rated 3.9 out of 5 by 10. Rated 1 out of 5 by GPR1 from Broken handle after only a few months We have had this pail for 5 months. Used for treating water for our fish tank. The handle broke when lifting. The handle is plastic and obviously a weak link when using this pail. Avoid this product if you are filling with liquids. Rated 2 out of 5 by SDCA11 from Handle breaks I have two of these. The functionality is good due to the bucket's elongated design (oval rather than circle). Problem is with the handle where it attaches to the bucket. This is not as durable as it should be. I have one bucket that has lasted several years...I liked it enough to buy another. Unfortunately, the newer one was broken within a year. Rated 5 out of 5 by karebear13 from Love this pail! I love this pail. It is easy to use and doesn't get to heavy to carry. The spouts on the sides make it easy to pour out when you finished. It can easily be stored on a shelf or hook in your garage! Rated 5 out of 5 by Ms48 from I love this bucket! I use this bucket weekly or more often to clean my house. I love the easy carry handle, I like the two pour spouts on either side of the bucket that prevents messes when dumping out water, and I like the overall size. It doesn't get too heavy to carry and it is easy to store on a hook in my garage. I highly recommend this product! Rated 4 out of 5 by Deb G from pail is great I use the pail to take water to my flowers and my dogs. The handle broke apart, but the company is sending me a new handle to replace it. Rated 5 out of 5 by eyemsly from great shape for a larger volume bucket this is great. it has been designed so it can fit into a smaller space because of it's oblong shape. i love the sturdy handle. caution, it does get HEAVY when full. Rated 5 out of 5 by petname2 from Great Pail I love this pail or should I say my husband loves this pail. He uses it when he washes the floors in the house (it's his job). the mop he uses fits right in the pail and the spout makes it so easy when he gets rid of the dirty water. It does not splash around and pours out in a steady stream. I recommend this pail for anything really but for the use of washing the floors it is great. Rated 5 out of 5 by dahinc from Excellent American Made Value Some have said that Americans do not make quality products. That is wrong considering the quality of the Sterlite items that I have purchased and still own. This is true with my new 16 quart pails.